Unions reminded backslapping Tory leaders today that Britain is in the grip of the worst economic crisis in a century despite 0.6 per cent growth in the last quarter. Smug PM David Cameron claimed on Twitter that the figures showed Britain is "on the right track" and insisted his government is "building an economy for hardworking people." Tory Chancellor George Osborne said Britain's gross domestic product (GDP) was "better than forecast" but failed to mention that it is still 3.3 per cent below pre-recession levels. TUC leader Frances O'Grady reminded the pair that the economy has grown half as much as they boasted it would when they cobbled together the Con-Dem coalition in 2010. "It's a measure of how poor the economy is faring that this level of growth is being welcomed," she said. "With workers in the midst of the longest wage squeeze since the 1870s and unemployment still over 2.5 million, it certainly doesn't feel like a recovery to many people." Labour shadow chancellor Ed Balls pointed out "this is also the slowest recovery for over 100 years" despite the fractional shift forwards. He said Britain would need to seal 1.3 per cent growth every quarter for the next two years "simply to catch up all the ground we have lost under David Cameron and George Osborne." Overall output in construction and manufacturing remains more than 10 per cent below pre-recession levels despite progress in the last quarter. Manufacturing recovered by 0.4 per cent after slumping consecutively for the last six quarters and the 0.9 per cent rise in construction is eclipsed by the 1.8 per cent fall in the first quarter. Construction union Ucatt labelled the figures "disappointing" and general secretary Steve Murphy reissued his call for "urgent" investment in infrastructure projects and social housing. There was also a 0.6 per cent growth in the service sector but concerns were raised that companies are hoarding billions of pounds that could be invested to spark real growth. Left Economics Advisory Panel co-ordinator Andrew Fisher said privateers have amassed the surplus, equal to 6 or 7 per cent of GDP, thanks to successive cuts to corporation tax and by slashing workers' wages. "Companies are quite logically refusing to invest substantially in new products, services or jobs at a time when consumer demand is depressed by falling living standards," he said. Tory Chancellor George Osborne revealed his latest desperate "big idea" for housing today that will see more of our cash used to bribe banks into lending to people who can scrape together a mortgage deposit. He plans to gamble £12 billion on high-risk 95 per cent loans where the state will act as a guarantor. That means we will pick up the tab for some of the loss in case of a default. Mr Osborne claimed following talks with construction firms that the extension of the Help to Buy scheme was "about getting behind those who aspire to own a home." It will cover houses priced up to £600,000 and will only help those wealthy enough to save a 5 per cent deposit. With average house prices at around £150,000 in Scotland and Wales - rising to a whopping £454,000 in London - people in the two nations would need at least £7,500 in cash to qualify for the mortgages or over £22,000 in the English capital. The government's obsession with fuelling the housing market even drew criticism from Bank of England chief Paul Tucker. He described the scheme as "unwise" in the long term because of fears that it will help reinflate a housing bubble that has left hundreds of thousands packed into expensive private rented accommodation. Construction union Ucatt general secretary Steve Murphy accused Mr Osborne of "fiddling round the edges of the housing crisis. Left Economics Advisory Panel co-ordinator Andrew Fisher ridiculed the Chancellor's announcement. "After three years of economic failure, Osborne's great new strategy for growth is a house price bubble," said Mr Fisher. "The Help to Buy Scheme is an admission of political failure and of the continuing fragility of UK banks. "This is nationalising the risk and privatising the profits again - a bank bailout by stealth." He added: "The solution is not subsidies for the big construction companies instead of the banks, but for councils to borrow and build to meet local need." The UK House of Commons Public Accounts Committee is examining some of the financial affairs of Prince Charles, heir to the British throne. The Committee should be concerned that the Duchy of Cornwall, Prince’s business arm, is exempt from corporation and capital gains tax. This means that the Duchy does not make any financial contribution towards the social infrastructure used by it. Its tax exemptions also give it unfair advantage over its rivals. The Duchy of Cornwall is the remnant of a bygone feudal age. The Duchy’s estate was created in 1337 by Edward III for his son and heir, Prince Edward. It provides income for the Duke of Cornwall, always the male heir to the throne. Today, the Duchy’s estate is no longer confined to land in Cornwall. It is a sprawling conglomerate, the third largest landowner in the UK, owning 53,154 hectares of land in 24 counties, mostly in the South West of England. The Duchy’s 2013 balance sheet shows net assets of £762 million though the market value is likely to be several billions. Its portfolio of assets includes 3,500 individual lettings, including 700 agricultural agreements, 700 residential agreements, and 1,000 commercial agreements. The Duchy owns Dartmoor Prison, the Oval cricket ground in London, a Waitrose warehouse in Milton Keynes, pubs, shops, hotels and building occupied by King’s College London. The Duchy also jointly owns a biomethane injection plant. The Duchy directly competes with commercial organisations to trade in property, house building, holiday rentals, organic food, jam, marmalades and biscuits. Its profits are boosted by the direct use of social infrastructure funded by taxpayers in the shape of local/central government, transport, security, legal system, and education and healthcare provided to its employees. But the Duchy makes no direct financial contribution towards any of this because it is exempt from the UK corporation and capital gains tax. The tax privileges of the Duchy are often defended by claims that it is a private estate (is the monarchy private? ), or that it is a private trust for the benefit of the Duke of Cornwall, or that somehow the Duchy and the Duke merge into one. An ongoing freedom of information case has lifted some of the legal murk surrounding the Duchy to reveal its economic substance: it is a legal person in its own right. The evidence provided by Prince Charles’s representatives showed that the Duchy enters into legal contracts in its own name. Its staff are employed by the Duchy rather than the Duke. The Duchy has sued and has been sued in its own name. It is registered for VAT and Pay As You Earn (PAYE). Employees give their consent to the Duchy to process their personal data. The Duchy is notified as the Data Controller under the Data Protection Act 1998. The Duchy has bank accounts in its own name. There have been transactions between the Duchy and Duke, clearly acknowledging that the two are separate. Parliament has no say in how the profits are to be distributed. The Duchy’s entire income goes to Prince Charles. Between 2008 and 2013, UK workers saw a real terms cut of 6% in their pay. By contrast, Prince Charles’s income rose from to £18.7 million to £20.2 million for the same period. A large part of this came from the Duchy of Cornwall, whose contribution increased from £16.27 million in 2008 to £19.05 million in 2013. As The Prince already pays income tax on the Duchy’s surplus, the Duchy does not pay Corporation Tax. If the Duchy also paid Corporation Tax, The Prince would effectively be taxed twice on the same income. Only companies pay Corporation Tax; many other large organisations which are not companies pay income tax. The Prince of Wales pays income tax voluntarily on the surplus of the Duchy of Cornwall, applying normal income tax rules and at the 50 per cent rate, and pays income tax on all other income and capital gains tax like any private individual. The £4.426 million includes VAT. It is worth noting that income tax and VAT payments, which are payable by all consumers, have been lumped together to produce a higher amount. Why this obfuscation by combining direct and indirect taxes? Any comparison of the Prince’s direct (income tax) and indirect (VAT) tax contribution with that of an ordinary citizen is difficult, but statistics provide some food for thought. The most recent government statistics show that for 2011/12, direct and indirect taxes added up to 36.6% of the income of the bottom 20% of the UK households, and averaged at 34.6% of the income of all households. The £4.426 million tax payment by the Prince amounts to 23.2% of his income. The controversies about Prince Charles’s business dealings are unlikely to go away. The feudal arrangements do not sit easily with contemporary notions of democracy and public accountability. Insetad, we must subject all payments to any part of the monarchy to parliamentary approval and scrutiny. Is the UK economy on the up? In the 2013 Spending Round in June George Osborne said he was taking decisions to "secure the recovery". Yesterday talk of recovery increased when the IMF revised its prediction for UK growth for this year from 0.7% to 0.9%. The extra 0.2% growth the IMF is predicting is not much to get excited about - especially when in 2010 Osborne's newly formed Office for Budget Responsibility was predicting growth would be 2.9% this year. However, the IMF revision is among a number of positive signals about the UK economy. Last week the Services PMI - a survey of purchasing managers in the services sector (which accounts for 75% of the UK economy) - indicated growth at its fastest rate for over 2 years. The respected and independent National Institute for Economic and Social Research predicts that growth in Q2 of 2013 will be 0.6% (while Markit suggests 0.5%). The prospects for George Osborne therefore seem to be looking up. However, all may not be what it seems. With no let up in the decline of household income, what is supporting this stronger growth in the services sector? As Duncan Weldon shows clearly and insightfully, household income is falling, but household spending is rising - eating into savings that recovered after the 2008 crash, but are now declining again (see graph below). What does this mean for the sustainability of the nascent UK recovery and for households? 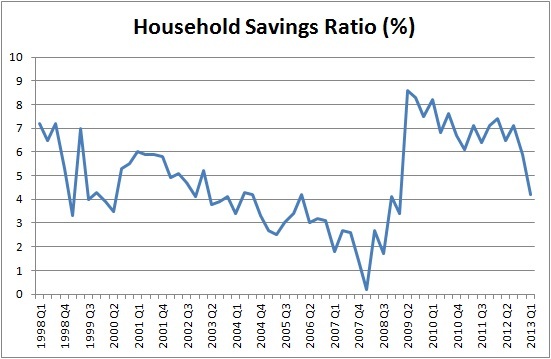 Well, as Weldon concludes, "a falling savings ratio really is underpinning our recovery. The 'new economic model' looks increasingly like the old one". This is even more so the case with the increasingly unreality of rising house prices, underpinned by the bubble-inflating Help to Buy scheme. The overall households savings ratio masks the reality that for many households they are not eating into their savings, but in fact sinking deeper into debt (good news for payday loan companies like Tory funders Wonga). For many people - including the 500,000 that are reliant on food banks - there is a real crisis emerging. Many are struggling to pay rents - especially with tax credit and housing benefit cuts to those in and out of work. With pay continuing to rise below inflation, and benefits similarly capped and being cut in cash terms for hundreds of thousands of households, the recovery looks very fragile. There can be no sustainable recovery through increased consumer debt. That way paves a renewed round of loan, credit and mortgage defaults - and with the state lacking the capacity to perform the sort of bailouts that were necessary in 2008 and 2009. The economy may well be on an upward trend at the present time and this could extend into the latter part of the year. But while economic growth in 2013 is likely to far outsrip the OBR's modest 0.6% prediction, in 2014 growth of 1.8% looks perilous, as does 2.3% in 2015. The upturn in the UK economy is built (again) on an inflating debt bubble, and the longer it inflates the more damaging the final bang when it bursts. As the manufacturing figures show, there is no evidence of rebalancing, no prospect of a revival in workers' incomes (through pay or benefits), and no substantial investment that could at least stimulate medium term growth and create jobs (in fact unemployment remains stubbornly around 2.5 million). So while Osborne will be cheering green shoots and patting himself on the back - most gratuitously at party conference in the autumn - the underlying problems of the UK economy remain unresolved, and any temporary respite may only be storing up greater problems for the future.